Gojo Orgyen Chemchok aka Choktrul Orgyen Chemchok or Gojo Tulku (b.1915?) was a direct student of Khenpo Ngawang Palzang and of Dudjom Rinpoche who taught secretly the Dzogchen pith instructions to students while in prison for twenty years. Gojo Orgyen Chemchok was born in 1915, in Tibet, as the son of Tulku Aka, who was himself one of the five sons of Orgyen Tutop Lingpa. Tulku Aka recognized his son Gojo Orgyen Chemchok as the rebirth of his own father Orgyen Tutop Lingpa. From an early age, it is said that Gojo Orgyen Chemchok clearly showed tendencies that had carried over from his former lifetimes as the tertön Orgyen Tutop Lingpa. Gojo Orgyen Chemchok studied with Khenpo Ngawang Palzang himself, living at his encampment from a tender age and completing his studies and contemplation there. He received from him the great experiential teachings of pith instructions that he had originally received from Nyoshul Lungtok.. Khenpo Ngawang Palzang also conferred on Gojo Orgyen Chemchok the authorization to pass these teachings on. Later, Gojo Orgyen Chemchok left the northern part of Kham and went to live in the southern reaches of eastern Tibet, in his mother’s birthplace of Gojo. He also received from Dudjom Rinpoche the entire Dudjom Tersar lineage. Gojo Orgyen Chemchok's noble mind was unchangeable like a diamond; no impure substance could penetrate it. His stable mind was unshakable like Mount Meru; no coarse and turbulent wind could shake it. Nevertheless, because of his holy nature, Orgyen Chemchok was never daunted; rather, even while incarcerated, he secretly taught many of his fellow prisoners according to their individual needs, imparting numerous extraordinary pith instructions of the Dzogchen approach. […]. Specifically, Gojo Orgyen Chemchok trained a number of sublime heart sons capable of upholding his lineage, including his own son, Choktrul Jigme Rinpoche, and Sang-ngak Tendzin, the tulku from Namchak Tsasum Lingpa's seat. 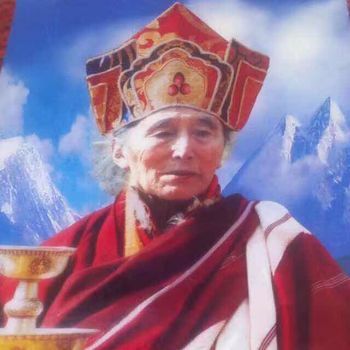 With such noble deeds, amazing under the circumstances, Orgyen Chemchok was able to continue his teaching without being crushed by the oppression of the invading armies. Due to his holy attributes and his fine character, Orgyen Chemchok was at peace with everyone, whether his fellow prisoners—ordinary men and women who knew nothing about the dharma—or his foreign jailers. After his release from prison, Gojo Orgyen Chemchok has been living in his home area of Gojo, eastern Tibet, and teaching many students in the southern reaches of Gojo, Markham, Tsawa Rong, and other places. Gojo Orgyen Chemchok was able to transmit the complete Dudjom Tersar lineage to Dudjom Sangye Pema Zhepa Rinpoche, an incarnation of Dudjom Rinpoche..
↑ Nyoshul Khenpo, A Marvelous Garland of Rare Gems: Biographies of Masters of Awareness in the Dzogchen Lineage (Junction City: Padma Publications, 2005), pages 527-28. ↑ Op. Cit., page 527. ↑ Thinley Norbu Rinpoche, 'A Brief Fantasy History of an Himalayan', Shambala, 2014, page 16. This page was last edited on 1 September 2018, at 16:45.